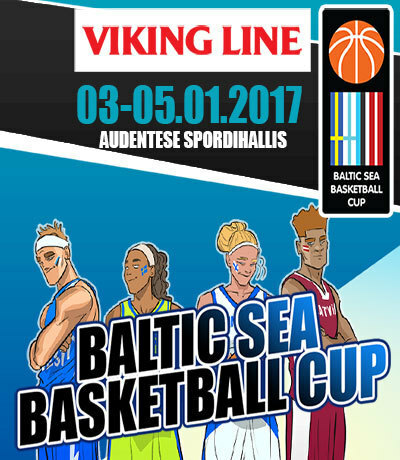 BSBC continued for day 2 at the Audentes Sports Hall in Tallinn as the Estonian national teams dueled Finland. The total of the day was 2:2 for Estonia, as both of our boys’ teams emerged victorious. The win guaranteed the top spot for U18, U16 has the deciding game tonight, as they battle Latvia. In the U16 category, the coaching staff, Gert Prants, Priit Vene and Joosep Toome, deserve quite a bit of credit, as they’ve managed to take the players and make them into a team in a very short amount of time. The team has shown the type of game all our teams are aspiring towards – soulful, competitive, fast-paced team ball, and that has earned them two of two wins. After a fairly even first half (43:37), the Estonian boys really put their backs into it and kept the win at home with the final score of 90:69. The end result isn’t entirely descriptive of the whole game, though, as before the deciding quarter, Estonia led by just 10 points (62:52). Showing a good game and shooting well from behind the arc brought success, however, with Kerr Kriisa, Hannes Saar and Ran-Andre Pehka all hitting important threes at important times. Rebounds 41-33, assists 18-2 (!) and turnovers 22-23 to Estonia. Shooting wise, the aim was better for all categories, as we won 2pt 51% to 50%, 3pt 53% (15/8) to 22%, freethrows 60% to 53%. Ran-Andre Pehka played the most of the Estonian players with almost 24 minutes on court, collecting 23pt+3rb+4as. Joonas Riismaa 17+8+3, Kaspar Kitsing 15+3+2. On the Finnish side, the players contributing the most were Thomas Exaucia (14pt), Mustapha Amzil with 12pt+11rb, Santeri Makkonen 11pt. In the Latvia-Sweden showdown, Latvia put on a good ending and took Sweden 75:69 (39:41). Sweden was ahead by 2 in the last quarter, but some well-timed shots by Kristaps Kilps and Latvian dominance in rebounds meant Sweden had to give up their lead, as well as the game. Ojars Beržins brought Latvia 25pt+4rb+4as, Kristaps Kilps added 17pt, Jekabs Beks 13p+18rb. On Sweden’s side, Barra Nije added 15+6+6, Andre Lorentsson 13pt, Zaba Bangala 11pt+10rb. The Estonian U18 team didn’t show their best game when battling Finland, but managed to win regardless, if only by a point – 69:68 (41:32). Having said that, it’s still not too bad a sign that even on an average day and with fairly average game, we managed to leave such a strong opponent behind (many of the Finnish roster having placed 7th in Europe past summer in Turkey). There’s still quite a fight ahead for us to make it to the A-division this coming summer. Estonia started steady, maybe too much so – the first quarter tied at 18:18. It was immediately apparent that Finland is not an easy team to break and the fight is going to be fierce. In the second quarter, Estonia worked the advantages well and benefited from the strong performance by the front court player Matthias Tass. We headed into half time with +9. The third quarter started with a bit of a shock, as Finland took advantage of our sleepy game, had a 11:0 spurt and pulled ahead 43:41. Estonia recovered from the shock quickly, however, and came back into the game, leading again after a few tense minutes, 51:48. The fight did become fierce, as suspected, and the remainder of the quarter saw either side lead in turns. The teams headed into the last 10 minutes at essentially 0:0, being tied at 53:53. It was anyone’s game. The final quarter turned very competitive and chaotic – Estonia led by 4-7 points on several occasions, Finland caught up. Both sides hitting important shots from the court and the free throw line, the score showed our lead 69:68 with 1:16 to go. Uncharacteristically, the numbers remained the same for the last minute-and-a-bit, with both sides trying to frantically improve their score. Finnish turnover, our missed shot, their missed shot, our rebound… and the final whistle. A very close win, but necessary and all the more sweet. Finland won the rebounds 42-34 and 3pt 29% against 23%. The rest was ours – assists Est 15 vs Fin 11, turnovers 15-17, steals 9-8, 2pt accuracy 47% vs 42%, free throws 86% to 68%. Matthias Tass brought 27pt+4rb+2bl in 30 minutes, raising his PIR to a high of 34! Sander Raieste (29 minutes) added 11pt+5rb. On the Finnish side, Ricky Waxlax helped out with 15pt+10rb (PIR 24), Mikael Jantunen 11pr+13rb+3st. In the day’s first game, which also turned quite tense and emotional, Sweden beat Latvia by also just a point – 62:61 (31:33). The turn in the game came in the third quarter, when Sweden came from -7 to +5 and despite the hard fight Latvia put up, took the close win. Mind you, the one winning point came from a buzzer beater by Beni Fungula, who, after two misses by Latvia, hit the two – 62:61! Latvia won rebounds by 44-30 at that, but Sweden showed better accuracy, with 2pt 47% vs 37%, 3pt 33% vs 21%. The buzzer-beater hitting Beni Fungula brought Sweden 20pt, Oliver Gehrke supported the cause with 11pt+6rb. Latvia’s most successful Adrians Snipke and Edvards Mezulis both brought the team 15 points and 10 rebounds. BSBC starts tomorrow in Tallinn!